We can be puppet heroes, just for one day. Microsoft seems eager to capitalize on the Fable brand lately. The announcement of a Kinect-only spin-off, Fable: The Journey was met with either trepidation or ire by many in the core gaming community. 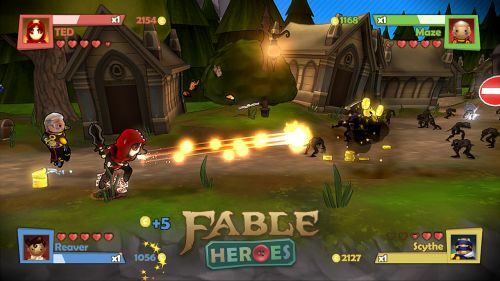 Now Fable Heroes has come along, spinning off to an entirely different genre: the beat-em-up. Reaction from fans and critics has been surprisingly harsh, but is the outcry well deserved? On one hand, Heroes pretty much fails to capitalize on the Fable games’ strengths: story, humor, and player choice. On the other, it still manages to provide a fairly decent co-op beat-em-up experience. Let’s get the most disappointing element out of the way: Heroes has literally no story of any kind – no intro, mid-level cinematics, or anything. Now, brawlers aren’t frequently packed with drama, except for Guardian Heroes, of course. But even the aged classics like Double Dragon, Final Fight, and Streets of Rage all have intros and (usually) endings. Besides, Lionhead must have known that Heroes would be compared against Castle Crashers, the gold standard of modern beat-em-ups. That game managed to squeeze in enough narrative to keep things interesting regardless of its multiplayer focus, without the use of text or voice. Story or no, Heroes seems to be aimed at the younger set. Instead of controlling human characters, players take on the role of wooden puppet versions of characters from the proper Fable games. At the start, you can only pick from four characters: Hero and Hammer (both melee types), Reaver - a gun user, and Garth the mage (also ranged type). Several more characters can be unlocked by beating the game or purchased in the post-level minigames. Playing Fable: the Journey when it comes out will also unlock a couple of exclusive characters (and gold can be transferred between the two games). Heroes’ combat won’t win any awards for innovation, but it gets the job done. You’ll mostly rely on mashing the standard attack button (X) to deal damage. Strong attacks (Y button) are just plain too slow to be effective unless upgraded. Forget about chaining the two attack types; Heroes lacks even a rudimentary combo system. Area attacks (Right trigger) provide another assault option, though they cost health so I rarely used them. Annoyingly, you can’t walk through other players or enemies, but the roll button (B) makes getting away from Balverines and other unfriendlies relatively painless. Whenever a player dies, he or she gets to continue fighting as a ghost. Ghosts can’t pick up gold, and the game ends when no living players remain. Picking up hearts returns deceased players to life – usually a good thing, unless the departed is just dead weight. Like Castle Crashers, each character levels up independently. Unlike that game, you’re never truly solo here; any empty spots in a single- or multiplayer game get filled by AI companions. Though the bots behave kind of mindlessly, they do make playing by yourself feel less lonely. Plus, whatever gold or upgrades a bot acquires actually count towards that character’s progress for the host player. In other words, even if you play alone, you’ll be leveling up four of your characters at once. Page created in 0.9622 seconds.